GALION — The City of Galion will continue to work with residents and businesses with the most serious storm damage. Affected residents may call the city at 419-468-1857 if they are still without power or for other unmet needs. Anyone who experienced property damage should document their losses — that includes taking lots of photos if possible — and file claims with their insurance provider. If you do not have property insurance, please call the city immediately at 419-468-1857. Crawford County American Red Cross – 419-562-4357. Emergency supplies and shelter. Crawford County Job and Family Services PRC Program – 419-562-0015, extension 300. Emergency housing assistance. Ohio Heartland Community Action Commission – 419-468-5121. Food and clothing. Community Counseling Services – 562-2000. Mental health counseling. To aid residents who are cleaning up their property, the Taylor Road composting facility will be open the weekend of Nov. 17, 18. Also, the city’ service department will do limited curbside pickup in the coming days as time, manpower and other work permits. Workers will only be picking up limbs and yard waste, which should be piled near the curb. 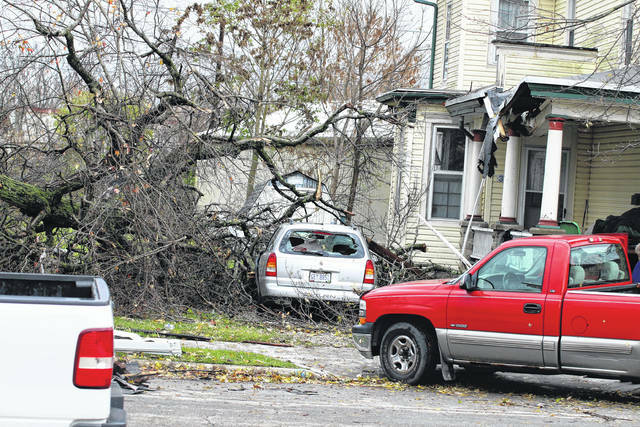 Erin Miller | Galion Inquirer Storm damage cleanup continues in Galion. If you’re still without electricity or don’t have property insurance, call the City of Galion at 419-468-1857.
https://www.galioninquirer.com/wp-content/uploads/sites/38/2017/11/web1_IMG_5352.jpgErin Miller | Galion Inquirer Storm damage cleanup continues in Galion. If you’re still without electricity or don’t have property insurance, call the City of Galion at 419-468-1857.